We had some. For several years now, my immediate family has been meeting at Niagara Falls for our family Christmas. It works out really well – the Canadian branch has a shorter drive but has to deal with a border crossing, and the Ohio branch gets to skip the border but drives a little bit longer. The hotel where we stay lets us use a large common room for our family party, and everybody enjoys the saltwater pool. Except after they have to get out, because then they’re cold. COLD, MAMA, I’M COLD!!!! 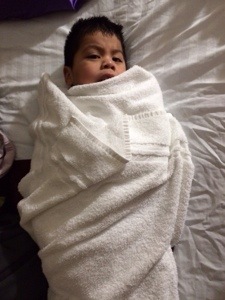 I wrapped him up in, I think, all the towels in the room, and he warmed up enough to give me the stink eye for taking his picture. The real adventure was trying to get any sleep with two insane boys in the room. There were double beds, so the plan was for Paul and I each to take a boy. This seems to work for other people. Levi started the night out with me. He’s been yelling in his sleep every night around 10:45 or 11:00 – if I’m up I’m usually out in the living room and can hear him. He yells for a few minutes (it’s pretty awful; it sounds like he’s being beaten) and then lies down again quietly. It doesn’t seem to help to go in and talk to him – he doesn’t even really know I’m there – so I just let him go. However. It’s slightly more stressful to be awakened by someone yelling in your ear, and then to think about how the people on the other side of the wall must be thinking I’m beating my children in their beds. But he settled down eventually. Then he fell out of bed, and there was a lot of confused crying. Then Elias fell out of the other bed, and when he calmed down he wanted to sleep with Mama, so he crawled in between me and Levi. Then Levi hit him. Then Elias cried some more. It’s fuzzy because I was really very very sleepy, but I think this was eventually resolved by Elias burrowing into the top half of my body and Levi latching on to my leg. I had kind of forgotten how much I don’t like sleeping in hotel rooms with the kids. Or not sleeping. But we all finally drifted off more or less peacefully, until around 3:00 in the morning when Elias woke me up whining in my ear. Oh, the whining this child can do. He is a champion. More than once, I have locked the bedroom door and gone way back into the bathroom where I couldn’t hear him anymore, just to get away from the whining. I will not give him what he wants, and he will not stop whining, and I … have to go away. In reflective moments, I find his tenacity sort of amazing, but mostly I just want to cover my ears and go rock in a corner somewhere. So I was less than pleased to be awakened by a whine in the wee hours. I may have said, “WHAT?! ?” in a less-than-friendly fashion. “NOOOOOO!!! !” my tormentor wailed, “He’s out DERE!” And he pointed at the door of the hotel room. “No he is not!” I countered. Because DUH. “YES, Mama! He’s out dere. I want to go out where Beanie is!” And he took my hand and pulled. And so I got up and went over to the door, just so he would stop already. And I opened the door, and there was Levi, sleeping soundly on the floor in front of the door to our room. I nearly had a heart attack. I ran into the hall and grabbed him up and ran back into the room and put him down on Paul’s bed and climbed back in with Elias and hugged him really hard and told him what a good boy he is. Oh, and I latched that bar latch thingie on the door. And then Elias drifted back to sleep while I laid there and sweated, thinking about all of the horrible things that could have happened to a sleepwalking five-year-old boy in a strange hotel in the middle of the night. Levi has no memory of this adventure, and Elias hasn’t mentioned it, besides collecting accolades from both parents in the morning. I told Paul about it several hours after it happened, because he slept through the whole thing. I guess it’s good one of us is a terrible sleeper. Levi was wearing gray/black camo sleeper pajamas and lying on a dark patterned carpet. It’s not like I couldn’t see him or anything, but he did nearly blend in. I rushed out into the hall wearing only a tank top and underpants. I hope no one saw me. I am really, really glad that door didn’t click shut behind me. So. Never a dull moment, but much to be thankful for. And I don’t think I’ll probably forget to latch the door again. Let’s hope he’s done sleepwalking by the time he’s tall enough to undo the latch. Or maybe we’ll just stay home. My mom actually used to sleep on the floor of the hotel room in front of the door because my brother was a sleepwalker. Carol, this post is so funny! What an adventure it must have been! Does Levi sleepwalk at home? Hope you guys had a happy new year! Christine, I don’t think he usually does at home. He does the crying thing, but otherwise not that I know of. Maybe just all the excitement? Hard to tell!